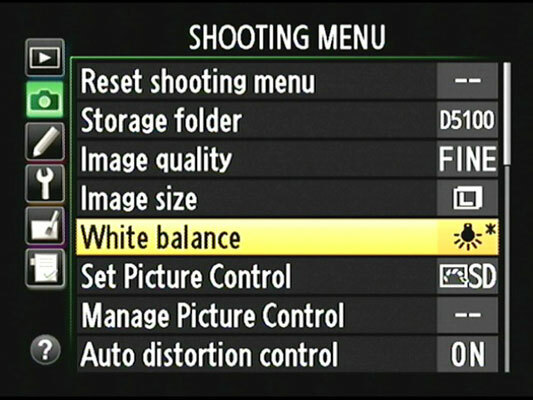 Display the Shooting menu, highlight White Balance, and press OK. Highlight the White Balance setting you want to adjust and press the Multi Selector right. Fine-tune the setting by using the Multi Selector to move the white balance shift marker in the color grid. As you move the marker, the A-B and G-M boxes on the right side of the screen show you the current amount of color shift. A value of 0 indicates the default amount of color compensation applied by the selected White Balance setting. Press OK to complete the adjustment. After you adjust a White Balance setting on your Nikon DSLR, an asterisk appears next to the icon representing the setting on the Shooting menu (and possibly other places, depending on your camera model: D3100, D5100, or D7000).